CLICK HERE FOR YOUTUBE VIDEO ON THE INSCRIPTIONS. 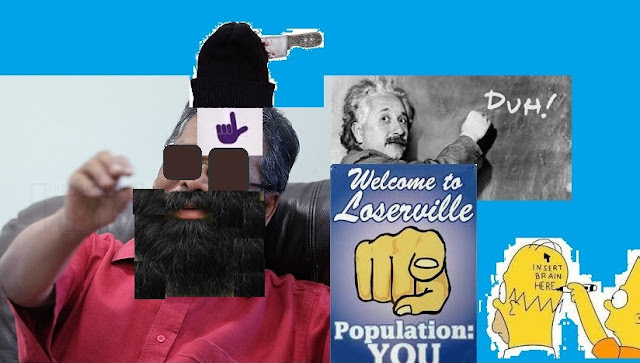 (Unfortunately, the video narration is in Tamil, but the pictures tell a thousand words). Yet another relic testifying to our (Malaysia's) rich and varied history and heritage lies almost forgotten in the beautiful and serene grounds of the St.Anne's Church in Bukit Mertajam (BM), in the mainland part (as opposed to the island) of Penang. The St.Anne's feast at this BM church draws huge crowds and international visitors every year in July. 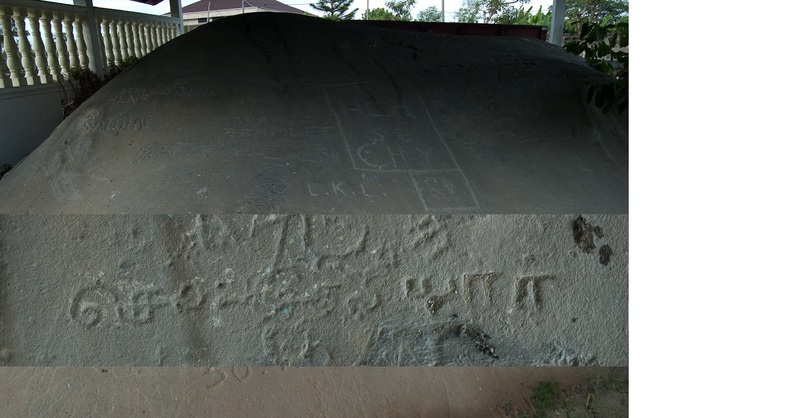 The Batu Bersurat Cherok To'kun was discovered by Lt. Col. James Low in 1845. Interestingly, James Low was also the discoverer of the Kedah Annals or 'Merong Mahawangsa' (1849) and, the Bujang Valley (1864) located some 15km from Sg.Petani in Kedah, all signs of the ancient significant Indian/Hindu/Buddhist presence in Malaysia. CLICK HERE FOR WIKIPEDIA ON BUJANG VALLEY. 1. I acknowledge the enemies of the contented King Ramaunibha and the wicked are ever afflicted. 2. This is said by Manikatha, the protector of all great Buddhas. 3. In every form of life Knowledge becomes manifest everywhere and in every way. 4. 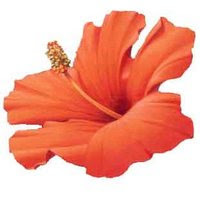 Karma, which sports with passion, is the cause of transmigration. The entire area, including Cherok To'kun and Seberang Prai (Province Wellesley) including Penang, was part of ancient Kedaram, the Indian name from which Malaysia's Kedah is derived. Which part of India this King Ramaunibha came from, or who his enemies were in Malaya that he decimated, are not stated. Perhaps, more details and facts are to be found in the yet unexcavated part of the boulder. A short walk away, behind the church, are to be found more rocks and boulders, and hills which may have been have been quarried for granite. James Low's name can be seen clearly carved on the rocks, as well as some graffiti. This location and the boulder has been gazetted as a heritage site since the '70's. The rock is well protected by a roofed shed. Cherok To'kun is also, of course, the birthplace of Anwar Ibrahim (1947), whose grandfather, according to one source, was a Tamil Brahmin named Rama Iyer!! CLICK HERE. STUPIDEST STATEMENT EVER BY 1GDB CEO ARUL KAUNDA KUNDI! NOT FIT TO MANAGE A THOSAI STALL AT A PASAR MALAM! WHERE WAS HE WHEN GOD GAVE OUT BRAINS? By and large, given the deterioration of spoken and written English over the last 30 years by deliberate BUMNO/SCUMNO government policy and design, one does not in general expect our GLC CEOs to make sound or sensible statements whenever they open their mouths. More so if they tout about that they were great debaters in school some 30 years ago, and then spout totally illogical garbage and gibberish and indulge in verbally diahorric oratory. Make no mistake. 1GDB (Grossmajib Development Board) CEO Arul Kaunda Kundi's#1 statement that it paid 3 BUMNO/SCUMNO cronies a criminally illegal over-inflated RM18 billion for their IPPs, to keep electricity tariffs low, belongs right up there with Rowan Atkinson's (Mr.Bean) classic "utter crapulence" charge. In the last 10 years, Tenaga has raised tariffs twice. Electricity bills have doubled for most home consumers as well as the private sector, across the board. So, where is the lowering of tariffs that Arul Kaunda Kundi shamelessly claimed without substantiating it one iota? Debater and orator? His alma mater would certainly disown and put him to the sword if he were to remind them he once roamed the corridors there! CLICK HERE for a msm report on Arul Kaunda Kundi's deceitful statement. What disgraceful conduct by, I am ashamed to call him that, a man, paid with Taxpayers' hard earned money, to spin and lie on behalf of that scum of a prime minister, serial liar Najib, and his government of murderers, thieves, looters and plunderers. This is no man but a crook who is conspiring with Najib and his thieving Cabinet for the biggest corporate cover-up in our history! Every one of them belongs in a prison cell. My fellow Malaysians let me be completely candid and straight. Najib criminally misused 1GDB to siphon billions of ringgit by over-inflating the IPP purchase price by about RM10 billion. It is publicly documented that BUMNO/SCUMNO received huge donations, at least RM250 million, from the ex-IPP crony-owners, financed entirely by the illegal pricing. How much more money found its way into Najib's personal off-shore bank account, one can only guess at. Corruption, kick-backs and plain stealing has become Najib and BUMNO/SCUMNO's order of business. Not to mention the odd murder or two! And it's not just sycophants and apologists like Arul Kaunda Kundi straining at the leash to perpetuate Najib's fascist and Mafia state that sickens us. After Kundi's stupid remarks and revelation, one would have thought the MACC and IGP would have pounced on Kundi, Najib and 1GDB's Chairman, Board of Directors and ex-CEOs to interrogate them about the RM18 billion IPP pricing fraud and corruption. Yet, the action by our exalted authorities is conspicuously glaring by its invisibility, and deafening, by its silence. What more proof do we need that the leadership at MACC and the IGP is in Najib's pockets, paid to lie, cheat and maintain a police state? As for Arul Kaunda Kundi, what can we say of a man who is dishonest to the core? If he has an ounce of decency in him, he should resign and expose this government of thieves. Otherwise, he is nothing but dung, a traitor to the nation, robbing without conscience mainly from our sick, huddled and poor Malay masses! And Arul Kaunda Kundi is busy assisting Najib to cook the books. That is why 1GDB's accounts for the year ended 31 March 2015 have yet to be audited. When these audited accounts eventually emerge, if at all, they will be a monument to creative accounting, i.e. a testament to the most blatant of lies and falsehoods. The message from that serially lying Najib is clear - ask me no questions and I will tell you no lies. He is basically telling us that as long as he generates profits from selling land to cover the multi-billion ringgit losses at 1GDB, no one should look closely at the fraud and looting that has taken place, acts principally committed by none other than himself! Has there ever been a more dangerous Kingpin criminal and traitor in our history than Prime Minister, Finance Minister, Chairman of 1GDB's Board of Advisers, Najib? Surely not! Donplaypuks® with criminally inflated IPP pricing frauds, o' great debater! BNM'S YETI CONTINUES TO COVER-UP FOR PM NAJIB'S BLATANT MONEY-LAUNDERING, CORRUPTION & LYING $2.6 BILLION "DONATION" EVEN AFTER MORE THAN 2 YEARS! 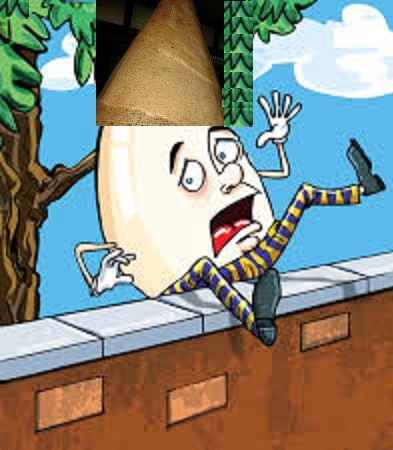 All sorts of bent games are being played by Malaysian Prime Minister's crooked cabal of criminals, henchmen, paid bloggers, PR spindoctors, murderers, thieves, international money-launderers, looters and economy plunderers. Totally credibility-lacking AG Pandi would have us believe that the MACC could not begin and finish questioning Najib on the $2.6 billion corruption, money-laundering and GE13 rigging charges by end October. So busy are MACC senior officers, that even an end November deadline would not suffice. The AG then had to invoke the full might of his powers to lay the law down on the MACC with 'a hook or by crook' delivery date by 31 December! Coming from a crook, no doubt this was done to give Najib more time to cook up a more convincing lying story than the pathetic 'It was a donation..I did not personally benefit from it'. What about that $2 million credited into Rosmah's personal account? Or cheques issued by Najib to 3.85 GPA genius Mazlan and Sharir for $1 million and $2 million respectively? Which century will AG Pandi order the MACC to move its arse on those cases? All this foot-dragging when the corrupt acts were revealed on 2 July! Which brings us back to the $2.6 billion remittance in March 2013 into Najib's personal bank account with Arab Malaysia Development Bank Group (AMDBG). 2. Or, AMDBG did inform BNM but Yeti and her team chose to close their eyes to it. They may even have been threatened by Najib, both PM and Finance Minister, to keep silent. They owed a duty of care to the citizens and wilfully allowed themselves to be bullied and coerced, and chose to cover-up rather than stand up and be counted. Either way, Yeti and BNM failed in their obligations to the country. There is no way a central bank could have an oversight system that could be so easily bypassed by any bank, not when it involves $2.6 billion!! "We are looking into it"!!??? More than that, Yeti is absolutely silent also about how and why US631 million of the original US$681 million was allowed to be transferred out of Najib's bank account overseas. If Yeti and BNM had accepted that the RM 2.6 billion was a "donation", why wasn't it transferred to UMNO's bank account in Malaysia by Najib, but allowed by Yeti and BNM to be TT'd out to a foreign bank account in Singapore? Somethings stinks nasty, doesn't it? 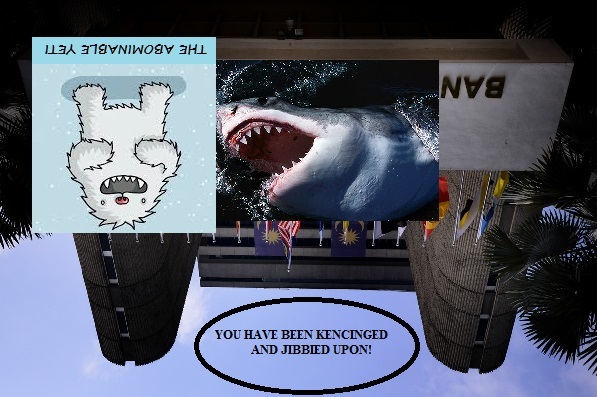 So, it's obvious that Yeti is no angel, no "international banking icon". She is as implicated in this $2.6 billion looting spree as is Najib and his crooked cabal. It's simply not possible that Yeti and BNM did not have the answers ready for thievery that goes back to 2013! Yeti is as much covering up for her own inefficiency and complicity as she is for Najib, his government of thieves, BUMNO/SCUMNO and 1GDB. So, if AG Pandi is serious, he should already have hauled up Yeti and BNM's top officers for questioning by the MACC or police. Pandi should also have given instructions to MACC, the police and Interpol to move in on the SRC $42 million Najib fraud duo of Nik Faisal Ariff Kamal and Suboh Mohd Yassin. Instead, Nik and Suboh have been allowed to flee overseas by Najib to avoid being questioned on an obvious fraud, to give Najib more time to destroy documents and the audit trail, and to coach Nik Faisal and Suboh how to stonewall the MACC when eventually questioned face-to-face! So, enough of these games, Najib, Pandi, Yeti, MACC and IGP. As at this point in our history, you all have zero credibility. We can see right through you like a sheet of clear glass! And you Yeti, you are fooling no one. Pascal Najadi swears that his father, before he was brutally murdered, reported to you and BNM about massive fraud and corruption relating to 1MDB and involving Najib and the $2.6 billion. Also, what's the point of you Yeti, now retrospectively withdrawing approvals given to 1MDB over the RM5.8 billion (US$1.83 billion) disclosure discrepancies, if now you don't follow through with charging them with false and misleading declarations under the Financial Services Act? The Rakyat wants action, not sandiwara and lots of thunder with no one going to jail. Either you start singing NOW or be prepared to join the others in the procession into Bamboo River Prison, soon! Donplaypuks® with the central bank and blatant kabber-ups, woman! HUSSAIN NAJADI MURDER COVER-UP COMPLETED. PASCAL NAJADI TO SUE IGP, AG & NAJIB'S GOVERNMENT OF THIEVES & MURDERERS! 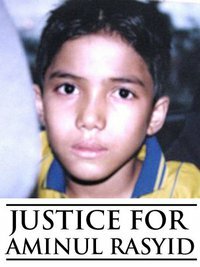 For my recent two blog posts on the murder of Hussain Najadi on 29 July 2013 and subsequent cover-up by the police under the direction of the IGP, AG, the serially lying Prime Minister Najib and his government of thieves, CLICK HERE AND HERE. Now my worst fears have been realised. The IGP and AG have declared the murder "solved" and the case "closed". 1. Convicted hitman Koong Swee Kwan having confessed to "businessman" Lim Yuen Soo having paid him RM20,000 for the contract killing. 2. Lim Yuen Soo having fled to Australia and China within days of the murder, and having been a fugitive for over 2 years. 3. Lim Yuen Soo having been placed on the Interpol Red List on application by the AG. The police revealed yesterday that Lim Yuen Soo was taken into custody by immigration officers on 15 October when he re-entered Malaysia at KLIA via a flight from China. He was released by the police after 8 days of remand and interrogation, when the AG stamped 'NFA' (no further action) on his file. Previously, there had been no response from the police to Pascal Najadi's (Hussain Najadi's son) public disclosure that Lim had returned to Malaysia much, much earlier and been moving about freely!! Furthermore, when Lim was "arrested", the police did not even inform Pascal or his lawyer Gobind Singh Deo, but kept the arrest/remand/interrogation a big secret. It's obvious that Lim's re-entry into Malaysia was stage-managed by the authorities with the strings being pulled without a shadow of a doubt from the office of 'the first among equals' in Putrajaya. Who else has that kind of power to order and compromise Immigration, the police, the IGP and the AG? Predictably, and correctly, Pascal Najadi has come out with guns blazing. He has signed the papers suing the IGP, AG, Najib and the Malaysian government over the murder cover-up and gross dereliction of duty. CLICK HERE for a report on the Lim Yuen Soo let-up. 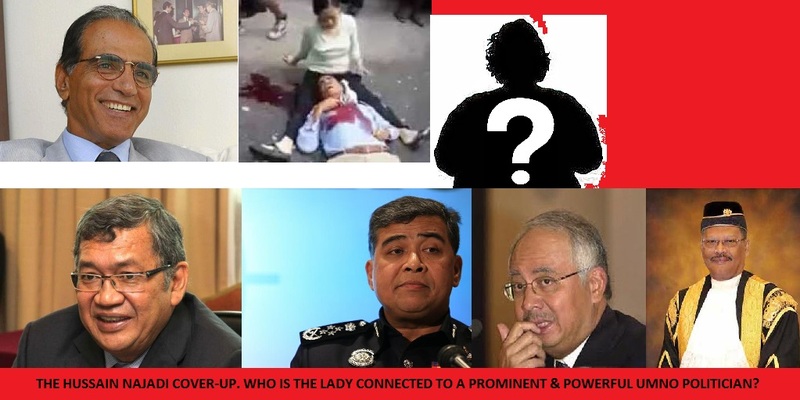 1. Who is the lady connected to a very powerful and prominent UMNO poilitician who someone claims gave the orders to Lim Yuen Soo to put the 'kill' contract out? How is she linked to the Altantuya murder? 2. How is it all linked to 1MDB and the serially lying $2.6 billion "donation" Prime Minister Najib? Pascal Najadi will be assisted in his quest for truth and justice by formidable lawyers like Gobind Singh Deo from Malaysia and Nick Kaufman (from Israel) a former prosecutor for The War Crimes Tribunal and the International Criminal Court at the Hague. Pascal has put out an international alert to the dangerous gangster regime under Najib, and the threat that it poses to the world at large. Pascal has engaged some of the best security experts anywhere to protect himself from possible retaliation from Najib's MAFIA. Pascal was not born yesterday. This time around, Najib and his crooked cabal are in for the fight of their lives. Dear readers, the fall of the Najib kleptocratic government (government of thieves) is imminent. You can do your part by putting pressure on your MPs (even if they are from BN) to continuously demand that Najib be booted out NOW. Make them vote against Najib's budget and for the no confidence motion against him in Parliament. Donplaypuks® with murder cover-ups, man! HUSSAIN NAJADI MURDER COVER-UP PLOT THICKENS. WHERE/HOW IF AT ALL DO DATUK RICHARD MORAIS & KEVIN MORAIS (ex-DPP/MACC) FIT IN THE PUZZLE? 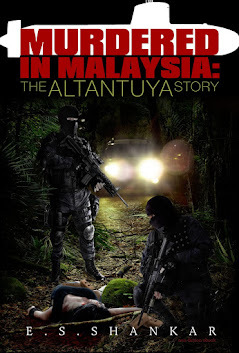 TO BUY BOOK 'MURDERED IN MALAYSIA:THE ALTANTUYA STORY' BY E.S. 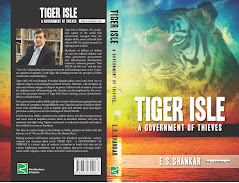 SHANKAR GO TO http://sarawak-report.myshopify.com/. CLICK HERE for my earlier blog post on 29 October regarding the Hussain Najadi murder. Pascal Najadi, Hussain Najadi's son, is convinced that his father was murdered for reporting to Bank Negara Malaysia (BNM) and the police about corruption at Arab Malaysia Development Bank Group (AMDB). In particular, this involved the RM2.6 billion (US$700 million) channelled into Prime Minister Najib's personal bank account with AMDB in 2013. CLICK HERE for Sarawak Report's article on Pascal's claims. Najib claims that this $2.6 billion was a donation from a friendly Arab source. But every other person in the universe knows that this is another load in the litany of lies that Najib has been spewing ever since he became prime minister in 2009. Everyone knows that this RM2.6 billion is linked to 1MDB and fraud there. Najib's further lie that he did not personally benefit from that money was laid bare and in tatters by ex-MCA chief Chua Soi Lek, who confirmed yesterday that all BN component parties received millions of ringgit from Najib for their GE13 campaig funding. It is a blatant act of corruption and serious money-laundering that would have seen any leader in any other country hung by his family jewels a long time ago. The Hussain Najadi police report has apparently gone "missing"; police claim there was no such report, while Pascal is unflinching in his stance that there were independent witnesses when the report was made. Meanwhile, BNM Governor Zeti, despite the passage of two years, has yet to give the nation a satisfactory answer as to whether AMDB reported the suspicious RM2.6 billion transaction in 2013 and she approved it blindly, or AMDB did not report it. Either way, the sloth and silence at BNM is a clear indication of gross oversight failure and a massive cover-up by Zeti and BNM. The fact that Najib is prime minster, finance minister and chairman of 1MDB's Advisory Board also explains how and with what degree of arrogance, anyone could ride rough-shod over our laws and institutional safeguards. BNM might have continued maintaining total silence had not the whole sordid corrupt act been exposed by Sarawak Report and The Wall Street Journal. Pascal Najadi has now revealed that shortly before his father was gunned down on 29 July 2013 in front of a Chinese temple in Lorong Ceylon, he (Hussain) had a meeting there with a certain Datuk Richard Morais. The details of what they discussed is not clear, but the police subsequently came to know about it, but did not inform Pascal. In September, Richard Morai's brother Kevin Morais, a Deputy Public Prosecutor from the Attorney-Generals' Chambers and seconded to the Malaysian Anti-Corruption Commission (MACC) MACC investigator, was abducted in broad daylight, bludgeoned to death in captivity, and his body stuffed into an oil drum filled with concrete. Within weeks 8 men were apprehended and charged with Kevin's murder. Apparently he was killed for investigating an army pathologist for corruption. CLICK HERE for The Malaysian Insider's report on the murder. Kevin was given a hero's burial and praised highly as a MACC investigator of great dedication, tenacity and ethics by colleagues and friends. However, his conduct in the Ramli Yusoff (ex-Director of CID) corruption case and the related arrest of his lawyer Rosli Dahlan, shows a bit of a dark side to Kevin. There is no intention here whatsoever to besmirch the reputation of the dead, but Kevin was found to have been quite economical with the truth several times. CLICK HERE. Federal CID Director Mohd. Salleh dismissed all speculation that the Hussain Najadi murder had anything to do with Kevin Morai's killing or 1MDB. But, who really is Datuk Richard Morais? What business or enterprise was he in that required him to discuss Chinese temple land matters with Hussain Najadi shortly before he was killed? Do the police have the answers to that? Was Datuk Richard Morais interrogated by the police and did they receive sensible and sound answers backed up by solid proof? Well, the plot only thickens. More so since Pascal has also claimed that police had not raided the home of fugitive Lim Yuen Soo who paid (now convicted) hitman Koong Swee Kwan RM20,000 to gun down Hussain Najadi. They had apparently not got hold of Lim's communications devices such as laptop, PC and cell phone or telephone records. As in the Altantuya murder case, official answers never seem to convince the public that all is as the police claim to be. Public trust in our IGP and top police officers is at an all time low. Donplaypuks® with thickening murder plots, man!